One of the world’s largest manufacturers of quality firearms and firearm safety/security products, Smith & Wesson’s origins can be traced back to 1850, when Horace Smith and D B. Wesson became acquainted and began marketing a lever action repeating pistol with a useful self-contained cartridge. 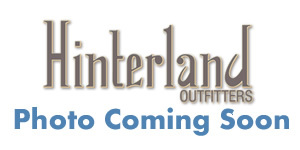 This first venture was not successful, but the company was sold to Winchester. Smith & Wesson then went to work on a second partnership to market the model 1 revolver, designed to fire their rimfire cartridge that contained not only powder, but also a lubricant positioned within the case amid the powder and the ball. The model 1 revolver was the original successfully self-contained cartridge revolver available in the gun marketplace, and it is what led the young company to fame and fortune. Among the company’s best-known achievements over the years has been the .38 Military & Police revolver. Also known today as the .38 special model 10, it has been in continual production since its development and is used by just about every police agency and military force around the world. Another Smith & Wesson handgun model, the .44 Magnum revolver, grew in popularity due to Clint Eastwood’s 1971 crime film, Dirty Harry. The .44 Magnum, along with the .357 Magnum, have been some of the most popular lines of revolvers of all time, and launched the era of stainless steel firearms. In 1955, Smith & Wesson introduced model 39, the first American made double action auto-loading pistol. Today, Smith & Wesson sells a large variety of pistols, revolvers, rifles and more used by law enforcement, militaries and civilians around the world. They also sell many specialty products and accessories including apparel, handcuffs, knives, coffee mugs and watches all bearing the famous company logo. Our online selection of Smith & Wesson handguns for sale includes all the top-selling models on the market today. We carry the full line of Smith & Wesson pistols and revolvers, from .22 Long Rifle to the most powerful .500 S&W and just about everything in between. Below is a partial list of some of the more popular Smith & Wesson pistols and revolvers — the full list is extensive and varied, with something for everyone. The tradition of innovation that began in 1852 still endures today in the Smith & Wesson line of versatile and powerful revolvers. Smith & Wesson manufactures some of the most accurate, reliable and powerful revolvers for sale on the market today. Regardless of your choice, from a concealable J-Frame to an extra-large frame Model S&W 500 Magnum revolver, you can rest assured that the same level of dedication to craftsmanship and design is embodied in each revolver produced by Smith & Wesson. The superiority of Smith & Wesson revolvers is evidenced in every model, caliber and frame size. Smith & Wesson separates their revolver variations and models by frame size, which is represented by a letter. 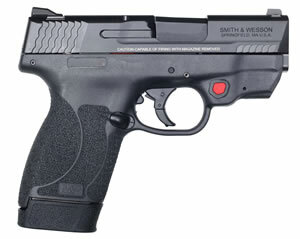 J-Small Frame: The Smith & Wesson (J) small frame is their compact revolver line which includes many different variations. J-frame revolvers are made from aluminum alloy, scandium alloy and stainless steel. They feature internal, external or shrouded hammers and come as a single/double action or double action only. K-Medium Frame: The Smith & Wesson (K) medium frame is their mid-size revolver line which also comes in different configurations. L-Medium Frame: The (L) medium frame is another model in Smith &Wesson’s mid-size revolver line. Both the K-frame and the L-frame have the same grip size, come as single/double action and have frames constructed from stainless steel for high strength. The (L) will have a slightly larger, beefier frame and larger cylinder compared to the (K). This also allows for the L-frame to hold one extra round (7-Rounds) with the .357 Magnum caliber. N-Large Frame: The Smith & Wesson (N) large frame is their full-size revolver line which are chambered in the powerful .44 Magnum/.44 Special and .45 ACP calibers. These frames are constructed from stainless steel and come as a double/single action. X-Extra Large Frame: This frame size is Smith & Wesson’s largest revolver line capable of shooting the powerful .460 S&W and .500 S&W Magnum calibers. These revolvers feature barrel lengths up to 8.38 inches with compensators to dissipate recoil. Made of heavy duty stainless steel, the X-frame come in a double/single action. A concealed carry that won’t snag in the pocket with a concealed hammer, this model holds five rounds of .38 Specials and weighs only 15 ounces when empty. 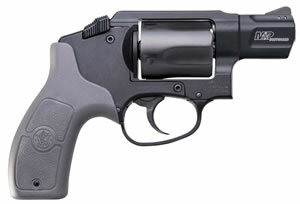 This 5-shot double-action .38 Special snub nose has gotten a notable reputation as a pocket pistol, and the aluminum alloy frame and stainless-steel cylinder and barrel are made to endure without issue. >Simply put, the model 500 is one of the most powerful revolvers in production. This double-action, 5-shot stainless steel revolver is chambered for the .500 S&W cartridge and is available in lengths from 4 to 12 inches. The longer models are capable of harvesting any game, while the 4-inch model is used for self-defense. A snub-nosed revolver advanced to the next level of performance, this 5-shot revolver of stainless steel construction has a 2 ½ inch barrel and is chambered for .357 Magnum. The revolver is cut for moon clips and comes with tritium night sights which offers exceptional accuracy. This double-action stainless steel revolver features adjustable sights and is offered in several different barrel lengths from 4 to 6 ½ inches. Chambered for .44 Magnum, .357 Magnum, and .45 ACP, this heavy frame revolver has earned an excellent reputation with handgun hunters and revolver enthusiasts, and is suitable for personal defense and competitions. .44 Magnum and come in barrel lengths from 2.5 to 6 inches. Frames are constructed from heavy duty stainless steel and come in a double/single action. 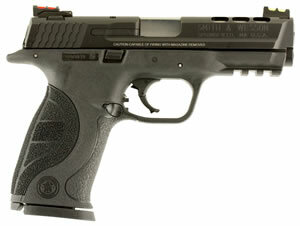 The 686 is also configured with red ramp front sights and adjustable white outline rear sights. These are J-frame snub nose revolvers with a snag free design perfect for concealment. The 340 revolver features a lightweight scandium, alloy frame, stainless steel barrel and an internal hammer. The smaller revolver still packs a punch shooing the .38 special +P caliber. Simplistic, reliable and easy to use are the qualities that make the 340 a perfect choice for a new shooter looking for a personal protection firearm. 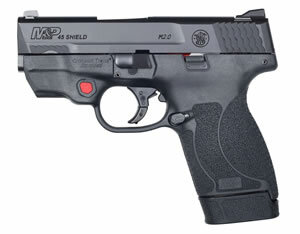 The Smith & Wesson M&P line is a semi-auto handgun that comes in numerous variations, sizes, actions, calibers and colors. Precision built to be the most accurate and reliable firearm, the M&P series is an experienced you have to feel to believe. Durable and comfortable, they are capable of handling as many rounds as you are. With an ever-expanding line of full-size, compact and sub-compact pistols, M&P brings premium handguns to serious shooters. Released in 2017, the M&P M2.0 pistol is an enhanced version of Smith & Wesson’s popular full-sized M&P. 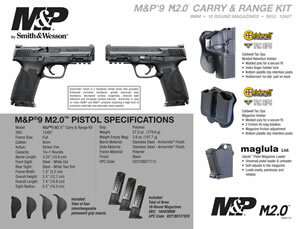 Available in 9mm, 40 S&W and .45 ACP, the M2.0 features key improvements to nearly every aspect of the firearm. Its light, crisp trigger with audible reset and strengthened chassis keeps you on target. 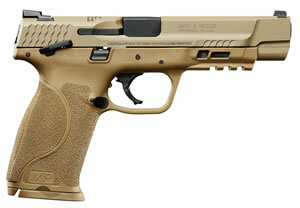 Accurate, ergonomic and durable, this is the sleek, modern pistol you have been waiting for. 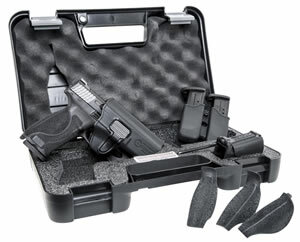 A proven pistol platform used by law enforcement agencies across the U.S., the innovative M&P pistol series offers a number of distinctive features. A lightweight, high-strength polymer frame reinforced with a rigid stainless steel chassis provide the base. The stainless-steel slide and barrel are finished with through-hardened black Armonite for durability. 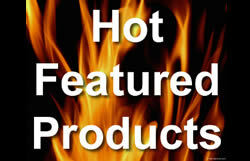 Safety features include a passive trigger safety, a sear deactivation lever and loaded chamber indicator. 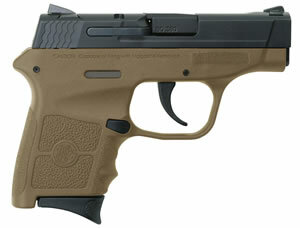 The M&P series is a striker fire pistol that is offered in a full or compact size and comes in 9mm, 40 S&W and .45 ACP. 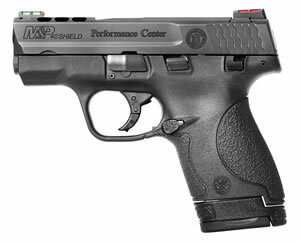 The M&P pistol is a perfect option for law enforcement, target shooters and concealment/personal protection. 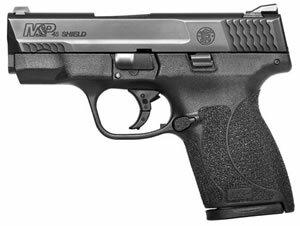 The M&P Shield Series has the power and features of the full-sized military and police pistols put into a slim, lightweight pistol design. 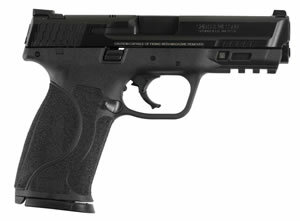 Easy to conceal, the pistol offers expert grade features with simple operations and dependable performance day or night. 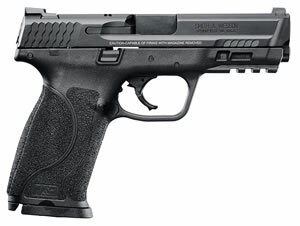 A striker fired, polymer-framed pistol with a single-stack magazine that’s chambered for the full-power 9mm cartridge, this M&P Shield Series also features models that can chamber the potent .40 S&W round and .45 Auto. The M&P Shield Series typically features a high-quality, 3-dot sight that is easy to use, as well as the striker-fired trigger that makes it easy to shoot. 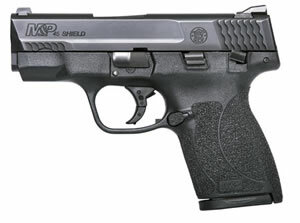 The M&P Shield Series is one of the most popular concealment pistols on the market with over 1 million sold. 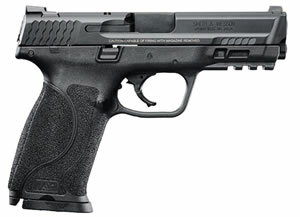 Compact, sleek and ergonomic, the M&P Bodyguard 380 pistol delivers personal protection in an easy to carry, comfortable platform. Chambered for 380 ACP, this lightweight pistol features a high strength polymer frame with an Armornite-coated stainless steel slide and barrel. 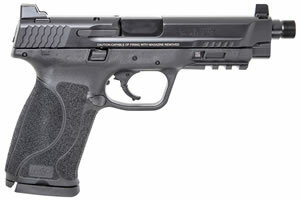 The Bodyguard’s features include a 2.75-inch barrel, unloaded weight of only 12.3 ounces and a Crimson Trace integrated laser on many of the variations. Earning a reputation for both distinctive style and uncompromising performance, SW1911 E-Series pistols are engineered and designed with meticulous care. The attention to every detail is expressed through aggressive texturing, a precision fit trigger, a high-strength titanium firing pin and a hammer-forged frame. The SW1911 is a single action pistol that is chamber in the .45 ACP and is offered in a couple of different colors and barrel lengths. Enhanced, elegant and elite, the SW1911 E-Series pistol line represents the finer side of firearms. The wood and metal finish on this pistol provide smooth handling with a classic look. Used by national level competitors for superior accuracy, the model 41 is a .22 rimfire target pistol with barrel lengths of 5 ½ to 7 inches. Part of this pistol’s accuracy can be attributed to the trigger pull which is crisp, set at 2.75 to 3.25 lbs. with a user over-travel adjustable trigger stop screw. A utilitarian budget firearm with textured grip, finished metal surface and a chrome-finished magazine that glides smoothly into the magazine well. A striker fired pistol with a bright front sight for easy target acquisition makes this a comfortable point and shoot firearm for your all-around needs. The Smith & Wesson Performance Series of pistols and revolvers are the embodiment of old-world handcraftsmanship and modern technology. 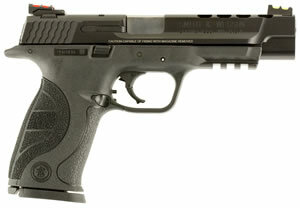 The Performance Center offers sophisticated shooters limited run, uniquely designed firearms with special features. The Performance Center Series is the flagship variants of the Smith & Wesson pistol and revolver product line. The Performance Center Series includes variations of the M&P pistol, model 41, SW1911, model 442, model 686, model 642, model 629, model 686 and many more. This series is about precision, built to be the most accurate and reliable firearms on the market that exceeds the standards of the most experienced and demanding shooters. Our online gun shop carries the full range of Smith & Wesson handguns for sale at low prices. If you need further assistance in choosing the perfect handgun to buy for you, please do not hesitate to reach out to our dedicated service team by email or phone at 877-446-8370. We’re always glad to help.